Five bedroom, three bathroom holiday house with panoramic views of the Whitsunday islands and coast. Cook up a storm in your seamlessly finished gourmet kitchen! Contemporary styled holiday house perched on a hill above Airlie Beach with uninterrupted panoramic views of the Whitsunday Islands and coast. This two storey holiday house includes five bedrooms and three bathrooms with superior fittings. There are three bedrooms on the upper level including the main bedroom which has a private ensuite bathroom and exquisite ocean views. There are two spacious bedrooms on the lower floor as well as a second living space and deck. Each bedroom is light, bright and spacious and complete with air conditioning and a ceiling fan for your comfort. The feature of this luxurious holiday house is the private pool and resort-style deck where you can treat your senses to the sun, salt and water. You can also entertain family and friends in the covered BBQ pavilion by the pool. There is a fully equipped gourmet kitchen with a gas cook top and top of the range appliances. Depending on your mood there is indoor and outdoor dining settings. For your convenience there is a laundry area with a washing machine and dryer. 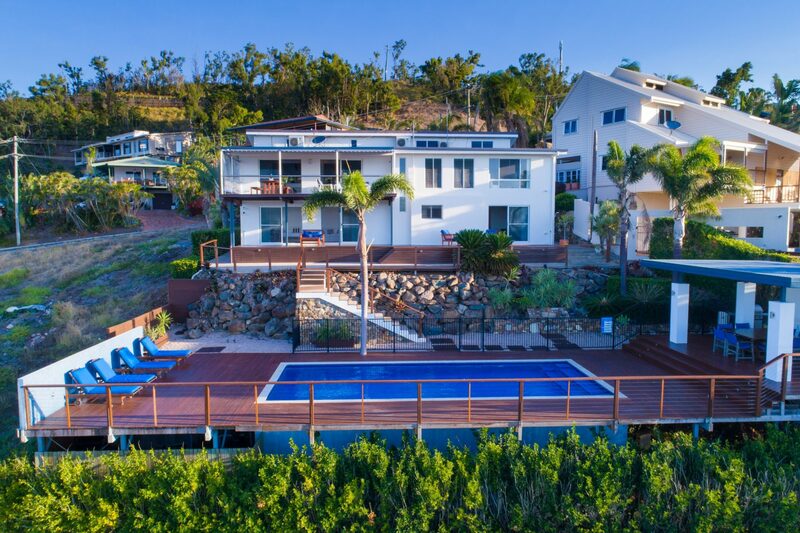 Nautilus on the Hill has everything you need whether you intend on relaxing by the pool or exploring the Whitsunday Region. Eight minute drive from Whitsunday Airport. Two minute drive from the town centre. Any cancellations incur a 30% charge, however no refunds if cancelled within 30 days of arrival. The main bedroom is on the upper level, complete with a modern en suite and exquisite views. Also on this level are two more spacious bedrooms, with a further two bedrooms on the lower level as well as a generous second living space and separate deck. Each light, bright and airy bedroom offers air conditioning and a ceiling fan for guest comfort. The main bathroom is well placed and boasts another indulgent angle of the extensive view. The downstairs decks are well situated and enjoy direct access to the pool. The opulent and spacious kitchen is seamlessly finished, complete with elegant, sleek appliances and a bold gas cook top.